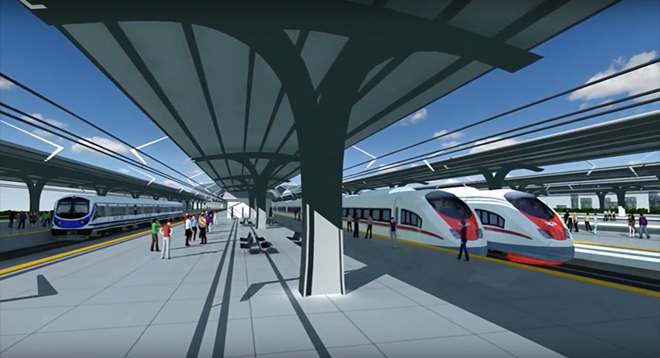 Bangkok (NNT/VNA) – Bidding for private sector involvement in Thailand's Eastern Economic Corridor’s (EEC) high speed rail links is expected to take place in March after the three links received approval at a recent meeting of its development policy committee. Minister of Industry Uttama Saowanayon earlier announced that a recent meeting of the EEC Development Policy Committee chaired by Prime Minister Gen Prayut Chan-ocha had approved the construction of three high speed rail links from Bangkok to the airports of Don Mueang, Suvarnabhumi and U-Tapao worth 200 billion baht. The links are one of five urgent infrastructure projects marked as integral to the success of the EEC as they are to reduce logistics costs, spur employment and provide tax opportunities for the state. The Prime Minister’s Office Minister Kobsak Phutrakul said on February 27 that the links will be constructed using a Public Private Partnership (PPP) arrangement, to reduce costs for the government and to increase efficiency. The project’s private investor will carry the burden of currency fluctuations and any delays. Private operators wanting to participate in the rail transport development, are expected to be asked to begin bidding in March with an International Bidding approach to be taken to ensure transparency and fairness to investors both in Thailand and abroad; European and Japanese companies have already expressed interest in the venture. On top of logistics, the links once completed are expected to attract 40 million commercial users a year, so the EEC body is to provide more information to the international community soon through Bangkok-based ambassadors.